Apparently, Snellville’s current mayor is a very slow learner. On the very same day of the public announcement that the City had paid (through its insurance company) approximately $15,000 to settle a lawsuit brought by a citizen who felt her Constitutional right to free speech had been violated, (when Kautz called her—you guessed it—“Out of order”) Kautz again bellowed “You’re out of order” in attempts to silence Mayor Pro Tem Tom Witts, Councilman Bobby Howard, City Attorney Tony Powell and myself. The suit brought by a citizen against the City was settled through negotiation, which tells you legal council felt very strongly that the City would lose if the matter went to court. Considering the result and financial consequence of this suit, one would think that a constant bellowing of, “You’re out of order”, is ill advised at best. 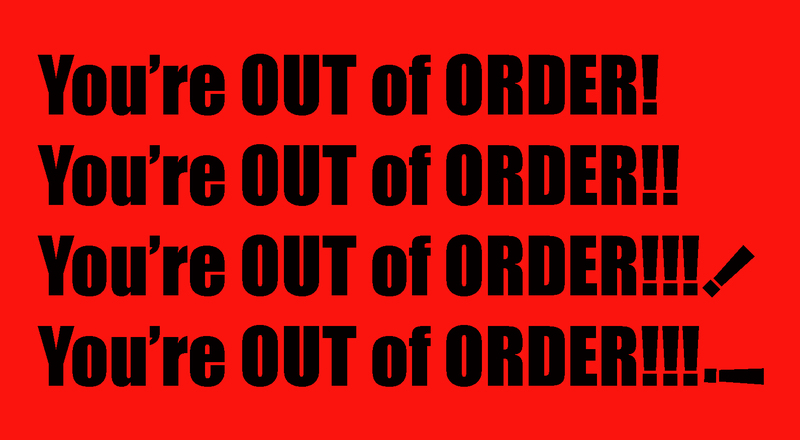 Which brings into consideration the question of when a call of, “You’re out of order” is appropriate. Under Section 2-53 Public Participation of the Code of Ordinances, paragraph 3 states, “Individuals who violate any rules of the city council may be ruled out of order by the chairman or on a point of order made by a council member”. So under the strictest interpretation, only a member of the public can be ruled out of order, and only for violating rules of decorum. Certainly, council members also have to abide by the rules of decorum, but calling for a “Point of Order” is not a decorum matter, and is in fact a specified right of every Council member. So a chairman’s proper response to a “Point of order” call (as delineated in the Code) is to inquire as to the nature of the Council member’s objection and to address the specific issue being raised. By bellowing, “You’re out of Order” in response to a “Point of order” call, the chairman has in effect stated the he or she has no intention of addressing the issue in question, and that is a clear violation of the Code, and potentially a right to free speech violation. Kautz has repeatedly used the “You’re out of order” bellow as a means of shutting off discussion of issues, or objections to procedures. In many instances, members of Council refrained from pursuing their right to speak because to have done so would have resulted in a protracted shouting match. However, one of the purposes of the January 9th specially called meeting was to further define procedures to ensure that all Council members can freely exercise their right to speak, which is essential to conducting city business. When the going got really rough, Kautz attempted to adjourn the meeting indefinitely– another clear violation of the Code. According to section 2-84, a motion to recess is classified as a privileged motion, “motion” being the operative word. The only legal way to adjourn a meeting is for a member of council to make a motion must be, seconded and voted upon. Kautz attempted to unilaterally adjourn the meeting indefinitely, with neither a motion nor a vote. Kautz supporters seem to feel that the actions of the majority of Council are intended to strip the mayor’s position of its powers. Quite the contrary. These actions are intended to bring clarification to the Charter and Code. Although it is understandable that some people might consider limiting Kautz’s ability to violate the charter and code as stripping her of “powers”. Hopefully, a judge will soon rule on the issues that have been in contention for quite some time. The importance of the impending legal actions is not who wins and who loses. The importance is that we achieve the clarity we need to efficiently conduct the city’s business.